Oh yes, that’s a sink in the middle of our extra bedroom. This little piece of plumbing marked this area from day #1 as Nicole’s space. Of course, when the picture above is the vintage fan, vase and flowers and jewelry box that were all gifts from Tim, you can see who wears the design pants in this household. This is a great little reading corner. The mini-sofa and curtains are from Urban Outfitters, the shelves are refurbished drawers. Notice the little bitty pots in the windows? Those are Nicole’s baby succulents = awesome. We love our balcony, but let’s be real – you can’t enjoy it during the (100 degree) summer days in Austin. That was a big driver of our inspiration for the space. And, it looks pretty damn good. The pole in the far corner is actually a small trolley rail that Tim welded a little hook on the top to hold the lights. In this top and bottom picture you get a good look at our seating. Tim built a little wooden bench to rest on top of the filing cabinet, and he rebuilt an old wooden bench in the below photo by spray painting it yellow and putting in nice Rosewood slats. Ok, so Tim makes most everything around the house. But, we aren’t 100% do-it-yourself-ers. Here are a couple store-bought things we just love. The first is the N & T cup. It is ridiculously cute hanging in the kitchen side by side. To balance out the cup’s love fest, here is the knife holder. Last are the curtain tie backs from Urban Outfitters. 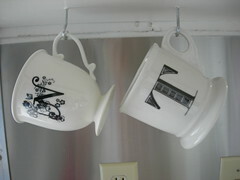 They are actually hooks, but we turned them at an angle for their new use. The white ceramic pairs well with the earthy shape for a refreshing, modern look. We have 3 sets of lockers in the living room. These are a great way to hide clutter, but still have storage close by (locker full of candles: check, flashlights: check…). Tim scored these years ago at an online auction that sells municipal surplus. The 3rd set we turned on it’s side so that it would become a long desk. The end was exposed, so Tim bought an old foundry mold and installed it to the end.